So, welcome to my blog. Let’s cut to the chase: I love comics. And more than that, I love sharing my love of comics—to other fans, to other professionals, and to future professionals. Really, to anyone who wants to hear about it. Comics are awesome. Writing and drawing comics is fantastic. Editing comics (as I do every work week) is a dream come true. And helping other people achieve that dream is one of the greatest feelings I’ve ever had—and that’s why I founded Comics Experience—to help future creators and people who are genuinely interested in comics learn about something they love (check out the main website if you haven’t yet). I’ll be talking about several different things here: lessons I’ve learned, strategies and tips on breaking into the business, what I’m reading or enjoying, giving updates on former and current students, to answering questions readers might have. Anything to do with comics is fair game. And when you hopefully start to think about taking one of the Comics Experience courses, just click over to the homepage and enter in your email address to sign up for the newsletter. It’s fee and I don’t spam you too often! Ha ha. I recently took a trip to West Virginia to be a guest lecturer at the West Virginia Book Fair in Charleston. It was a great trip and I met a lot of comics readers and professionals—more than I expected, actually. I gave two lectures. The first was on the creative process of creating a comic book from start to finish and what it means to work on modern myths—what responsibilities go with that duty. And the second lecture was on the difference between comics and graphic novels. Both a bit heady, but great topics. The crowds were enthusiastic and had great questions. But get this—my loving parents made the trip from Cincinnati to come see me talk. Very nice of them. They knew I traveled a lot to give these lectures, but they’d never seen me do it. I was a little nervous to have them in the crowd, but it was great fun and it was good seeing them again. After the conference, my parents and I took a drive north to Fairmont, WV. Where I was born. I lived there until the summer before I entered the first grade. For those first seven years, “The Fantasy Shop” was a weekly (or was it daily) stop for me on my little bike that had a hand-made bumper sticker that read “Yoda” on it. My two older brothers and I would go to “The Fantasty Shop” and rifle through whatever comics they had there. I remember the owner was a very nice man and the wood floors would bend and creak under every step. While in town with my parents, we drove by the old shop, and much to my surprise and joy—it’s still open! 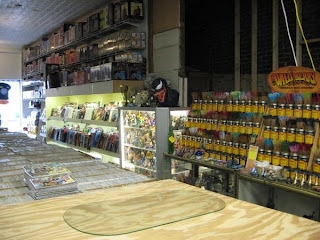 It’s now called “Comics Paradise Plus” and has completely converted to a comics and gaming shop. Looks like it’s doing a great business from what I could tell through the window. Anyway, the point is, that’s where my comics journey began. At a place now called “Comics Paradise Plus” in Fairmont, WV. From there, we moved to St. Louis, MO. And my brothers and I had to find a new comic store. But that’s a story for another time (or blog).